The chances are that Ultra HD on a whacking great television will be a familiar site before long, but Panasonic was showing off the impact that many pixels can have in a 20 inch television. The 20 inch sets are currently envisioned as being more useful to business users where detailing is vital or small text is necessary. Of course that's a limited audience, but the prospect of using this minimal pixel size across larger televisions is obviously hugely appealing. What's impressive is the sheer amount of pixels that are crammed into a small screen, and that means that the detail on show is akin to the OLED screens that made such an impact. Obviously cost is going to be a factor – with the screens likely to come at a bit of a hefty price. Don't expect to be using one as a monitor unless you happen to be the head of IT. Like its gorgeous big brother the Panasonic 8K Super Hi Vision television, the resolution of the screen is stunning. 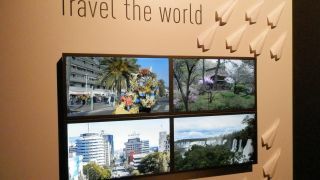 The monitors on display at Panasonic's huge stand at IFA 2012 were showing off flowers and landscapes and both looked beautiful, even from a matter of inches away.